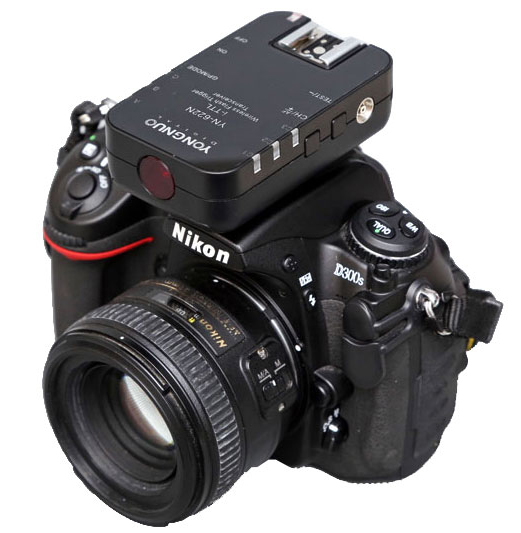 Following on from our earlier overview of the YN-622N i-TTL flash triggers, we’re testing out a couple more features that these devices have to offer. Following on from our earlier overview of the Yongnuo YN-622N i-TTL flash triggers, we’re testing out a couple more features that these devices have to offer. In this article we’ll be looking at high-speed sync: the ability to use flashes with your camera at fast shutter speeds without banding in your photographs. We’ve also been getting to grips with Yongnuo’s so-called “remote control mode” — controlling your flash setup using just the YN-622N transmitter, as opposed to “master control mode” (see first review) where you have a Commander flash sitting on top of your transmitter and make the adjustments from there. Why might you need high-speed sync? In this demonstration, we wanted to shoot our 50mm f/1.8 lens wide-open for a narrow depth-of-field, but this means letting a lot of light into the camera and we weren’t able to black out the windows of our studio enough to eliminate the unwanted extra ambient light. 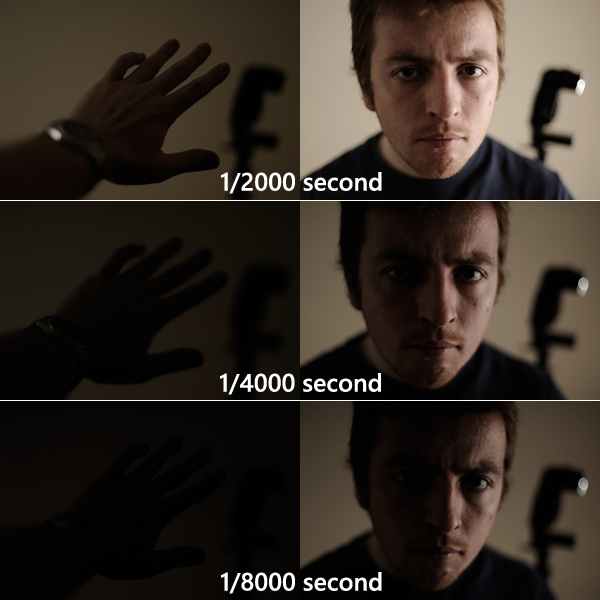 Increasing the shutter speed reduces the amount of natural light in the exposure. The Yongnuo YN-622N synchronises cleanly at all shutter speeds, as shown. However, at extremely high speeds, above 1/2000 second or so, the contribution from the Nikon SB-800 is reduced since the shutter simply isn’t open long enough to let all its light in — and this is more a limitation of the camera-flash combination than of the triggers. In this case we used TTL mode. On the left there is no flash and on the right is the same scene lit with a remote Nikon SB-800 bouncing light off the right-hand wall. Experimenting with different manual power levels could yield brighter results. Beyond that, you can try ganging together multiple speedlights, or use more flags and “negative fill” (black walls) in your studio to reduce the ambient light falling on your subject. There are three different operating configurations for the YN-622N system: master control mode (covered in our earlier article), remote control mode and mix control mode. The latter involves just setting parameters on the flash units themselves, so that you can mix together manual, TTL and stroboscopic flashes. Here we’ll be looking at remote control mode, which allows you to remotely adjust three groups of flashes without the need for a Commander unit. Covered on page 10–11 of the user manual, Remote Control Mode seems bewildering at first because, unlike the Phottix Odin and Kody TTL, we have no LCD control panel to view and adjust settings. And the corresponding written instructions are in confusing Chinglish. 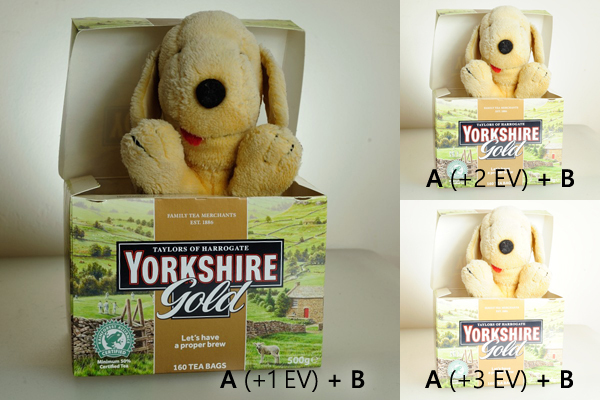 It’s actually deceptively simple once you’ve got your head round it. Set up your receivers in the desired groups. Make sure they are on the same channel as the transmitter. 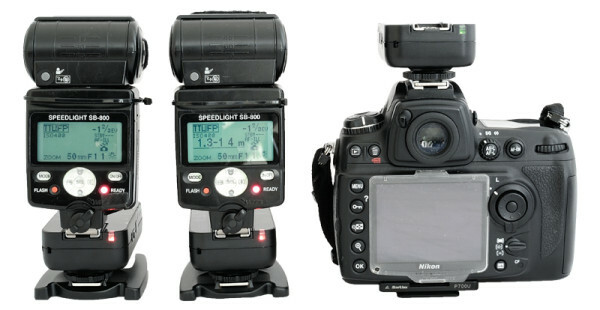 On the transmitter, decide whether you want to use your flashes in i-TTL or manual mode. You can switch between them by holding down the GP/MODE button on the transmitter. Hold the shutter button halfway down to send signals through to the receivers, then press it all the way to take a picture. Look at your picture. Are all of the groups firing at the right brightness? If so, great. Profit. To increase power by one stop, hold the plus (+) button down and let go when the correct LED is illuminated. C1 for group A, C2 for group B or C3 for group C.
To decrease power by one stop, do the same, but holding down the minus (-) button. To increase power by 1/3 stop, hold the plus (+) button down and let go when the correct LED is illuminated. A for group A, B for group B, C for group C.
To decrease power by 1/3 stop, do the same, but holding down the minus (-) button. Once you’ve wrapped your head around this and tried it a couple of times, it is actually quite easy to understand. If I wasn’t clear enough above, leave a comment below and I’ll try to clarify things. Having played with it for a little while, it’s actually very easy to use. No complex menus to navigate, just one button to press and wait. 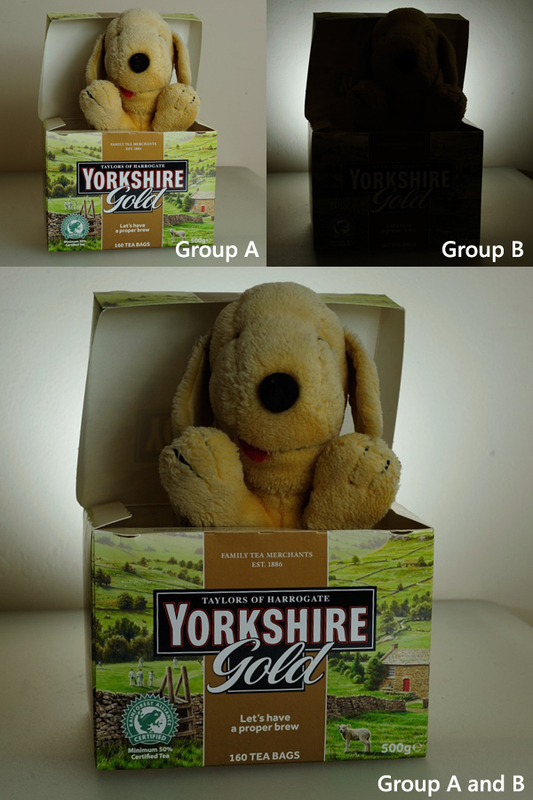 Use your camera LCD or a light meter reading to see that, eg, group A needs to be a stop brighter while group B needs to be 2/3 stop dimmer and group C is just right. There isn’t a way of reading off the absolute power levels or flash exposure compensation you have set, but you can take a relativistic approach instead. I can imagine getting used to this, but it could make it harder to replicate lighting setups from place to place unless I write down all the adjustments I’ve made. Still, this sacrifice could be worth the benefit of a lighter camera rig, with no heavy Commander flash unit sitting on top. 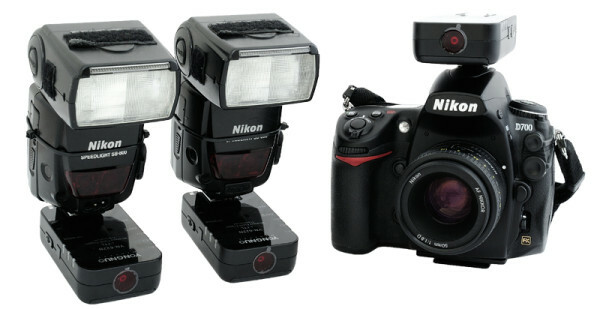 Plus if you only own SB-800s or SB-600s, there’s no need to buy a new flash. Here’s a quick scenario. 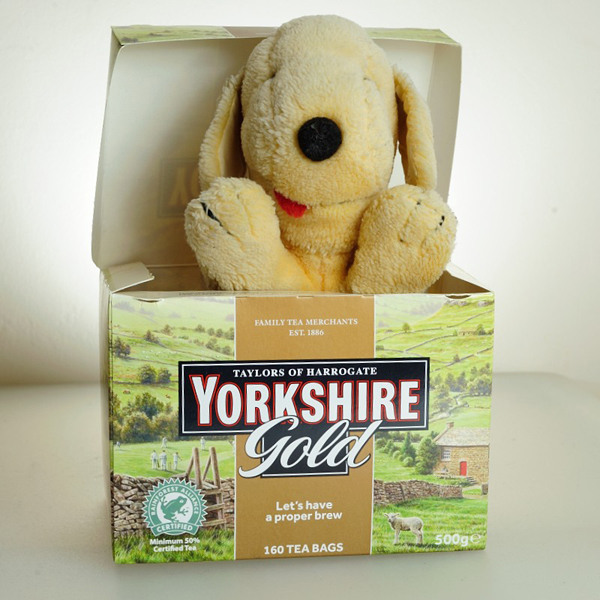 Spot the Dog is guarding the last few Yorkshire Gold teabags. Can we use a Nikon D700, the YN-622N and a pair of Speedlight SB-800s to light him properly? The main light (A) is looking pretty good on its own, but when combined with group B the camera’s matrix metering is getting confused by the bright background and mistakenly under-exposing our subject. A classic situation when flash exposure compensation (FEC) is needed. Holding down the (+) button on our YN-622N transmitter, I let go when “C1” is highlighted and it adds one stop (+1 EV) of exposure compensation to flash group A, giving the image below which is much more like what we want. 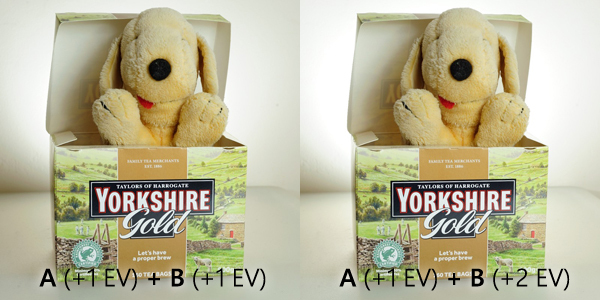 Repeating the process adds more stops of exposure compensation for an even brighter main light, but +3 EV is too much. If we want to make our background light brighter then it works the same way. Hold down plus (+) until C2 is highlighted to increase flash exposure compensation by 1.0 EV each time. And there we have it, a photo taken with two groups of wireless i-TTL flashes, each adjusted independently of one another without moving from the camera position. This example was pretty relaxed and contrived, but imagine using this for studio portraiture or even for events photography, say at a wedding reception. Of course not everybody is a fan of TTL mode. There are those of us who prefer the shot-to-shot consistency of manual mode. The YN-622N caters to these people too. 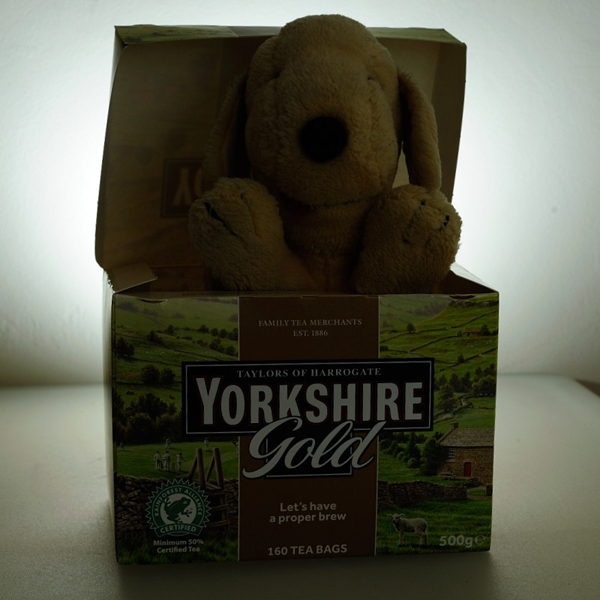 Spot is still guarding the tea, and in the meantime we have switched the YN-622N transmitter to manual mode, so that the LED now glows orange rather than green. Without making any adjustments, our first shot using manual flash looks like this. The arrangement of the lights is the same as before — one SB-800 in a beauty dish and another pointing at the back wall. Hmm. Both lights are, in theory, at the same default power level, which on the Yongnuo scale is called “1” and on the SB-800 is something like 1/128 of full power (I think). The background light doesn’t look too bad, but the main light is much darker because it is further away and losing intensity as it is diffused and reflected from the different surfaces of beauty dish. Not to worry! Holding down the (+) button and releasing on “C1” increases the Group A power level to double what it was before. Level 2 in Yongnuo terminology or 1/64 power in Nikon speak. Our first shot looks more than just one stop under-exposed so we do this a total of three times to reach power level 8 (1/16). And we increase Group B to power level 2 while we’re at it. So to recap, we’ve started off with two flashes at 1/128 power and manually adjusted them via 2.4GHz remote control to 1/16 and 1/64 for the main and background light respectively. Pretty handy, and once again we didn’t need to contend with an unwieldy top-mounted Commander flash or have to splash out on a new SU-800. 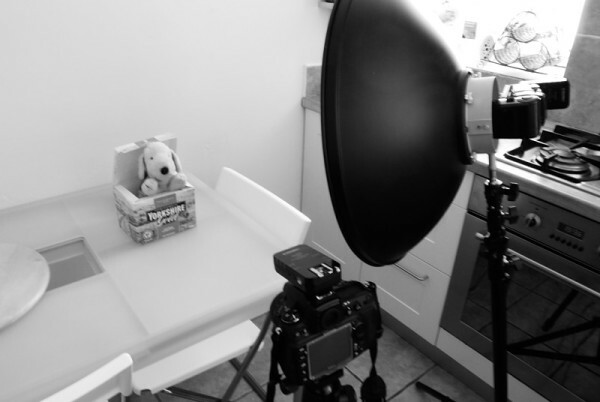 But we always have the option to add an on-camera flashgun, however capable, should we want some fill light later on. In our third and final article I’ll be looking at “Super Sync”, range, the AF-assist lamp and anything I might have missed so far (let me know in the comments). To read our initial hands-on review of the system, click here.